The United States of America is made up of 48 contiguous states, which means they are adjacent, and 2 non-contiguous states which means they do not border any other U.S. state. These two non-contiguous states are Alaska and Hawaii; which also happen to be the last two states to join the union (the U.S.A). On this page is a list of quick facts about these two states. This information includes such basic facts as when Alaska and Hawaii became states, what their population is, and how they became states. This information is written for both kids and adults. You will also find links to additional interesting facts about both of these states. 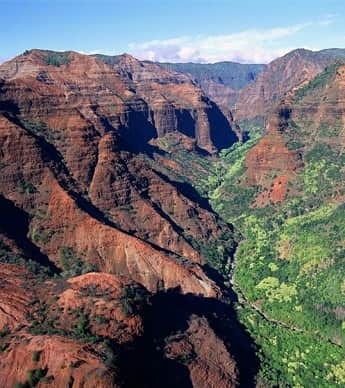 Click here for a great selection of Amazon.com books about Hawaii. The last state to join the United States of America was Hawaii. Below is a list of quick facts about this non-contiguous state; click here for a list of interesting Hawaii facts. Hawaii became a U.S. state on August 21st of 1959. It is the 50th and last state to join the union (U.S.A). This state is made up of eight main islands; the big island of Hawaii, Maui, Kauai, Oahu, Niihau, Molokai, Lanai, and Kahoolawe. The capital, and largest city, of Hawaii is Honolulu. The state abbreviation is HI. With a total area of 10,931 square miles (28,311 square kilometers) this state is ranked 43rd out of all 50 U.S. states. However due to volcanic eruptions Hawaii's land area is actually growing slowly over time. The population of Hawaii is 1,419,561 (2014 U.S. Census bureau estimate); the 40th most populated state. Hawaii is the only U.S. state that is made up entirely of islands. The highest point in this state is Mauna Kea; a dormant volcano on the island of Hawaii that rises 13,796 feet (4205 meters) above sea level. The state motto of Hawaii is "Ua mau ke ea o ka aina I ka pono", meaning "The life of the land is perpetuated in righteousness". The state song is "Hawaii Ponoi" (Hawaii's Own). The state nickname is the Aloha State. The state flower is the Hibiscus (also called the Pua aloalo). Alaska is by far the largest U.S. state based on total area; however is the least densely populated of the 50 U.S. states with only two other states having a lower population. Below is a list of quick facts about Alaska; click here for a list of interesting Alaska facts. Click here for a great selection of Amazon.com books about Alaska. Alaska became the 49th U.S. state on January 3rd of 1959. Alaska's population is 736,732 (2014 Census Bureau estimate) which ranks it 48th among all 50 U.S. states. Alaska is a non-contiguous U.S. state that borders Canada, the Arctic Ocean, Pacific Ocean, Bering Sea, Gulf of Alaska, and the Beaufort Sea. The state Abbreviation is AK. The capital of Alaska is Juneau. The largest city in this state is Anchorage. With a total area of 663,268 square miles (1,717,856 square kilometers) Alaska is the largest state in the United States. Residents of this state are called Alaskans. Alaska's state motto is "North To The Future". The state song is "Alaska's Flag". Mount McKinley is the highest point in Alaska, in fact at 20,320 feet (6,194 meters) above sea level it is the highest point in the entire United States of America. The state nickname is "The Last Frontier". Alaska's state flower is the Forget-me-not.